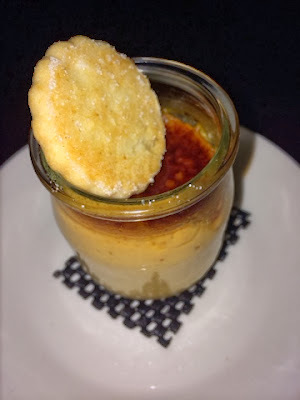 What's Up New Haven: ZINC Restaurant: My First Farm-To-Table Experience! 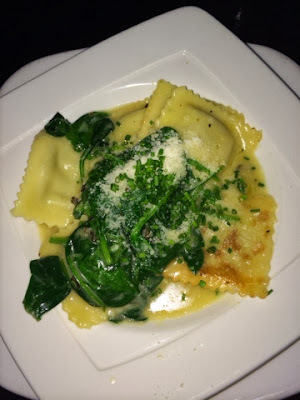 ZINC Restaurant: My First Farm-To-Table Experience! Heads up! This week is New Haven's Restaurant Week. There are plenty of stores participating in this promotion: a prix fixe meal at $18 for lunch and $32 for dinner. ZINC is a Restaurant Week participant, and in turn, my friends and I were happy new customers today. 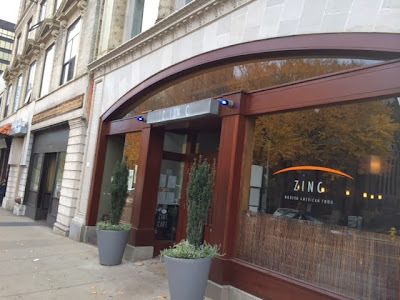 ZINC is located at 964 Chapel Street, right in the heart of downtown New Haven where Yalies, public transit buses and business people fill the streets. The earth tones and greenery in the front provided a welcoming atmosphere. The welcome continued inside the restaurant. The staff was attentive and friendly as we ordered our three-course, prix fixe lunch. I ordered the butternut squash soup, mushroom ravioli and creme brûlée. We noshed on some delicious, complimentary fennel bread with a tomato and pepper based dip while we waited for our meal. ZINC is a farm-to-table restaurant and lived up to the farm-to-table reputation: everything tasted so fresh! The meal was filling and portioned just right. ZINC is open six days a week and boasts different happy hour specials each day. When we left, other customers were very polite, mindful of holding doors for my friends and me. It was a pleasant experience all around and I will be back to check out a happy hour and try other cuisines on the menu! Topping off our meal with creme brûlée! Awesome info me and Steph must go their one day.